1. General Impact Water Quality Monitoring commenced on 4 August 2016. 2. 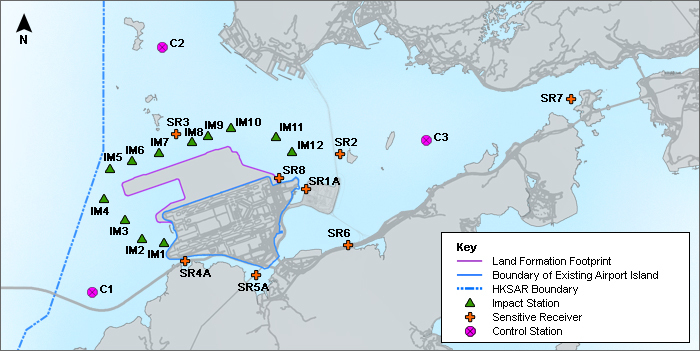 Water quality monitoring at SR1A commenced on 25 October 2018 with the commissioning of the HKBCF seawater intake. To better reflect the water quality in the immediate vicinity of the intake, the monitoring location of SR1A is shifted closer to the intake starting from 5 January 2019. 3. Station SR2 is a control station during flood tide. 4. For details on Notes 1-3, please refer to the Water Quality Baseline Monitoring Report and the Updated EM&A Manual. 5. Starting from 12 May 2018, 9 out of 12 impact stations are temporarily shifted to stay away from the enhanced silt curtain. For details of the enhanced silt curtain, please refer to the Silt Curtain Deployment Plan. 6. Due to progression of nearby construction activities, the monitoring location for SR8 is shifted to avoid unnecessary disruptions associated with ongoing construction activities starting from 5 January 2019.